Buying a digital piano is always exciting. Any instrument purchase is usually the result of a new desire to pick up a hobby or expand your musical skills. If you’re new to piano though you probably won’t want to spend a fortune on your first instrument, especially if you aren’t completely sure whether it will be a lifelong hobby. For this reason, we’ve collected and reviewed 10 of the best digital pianos under $1000 for 2019. Digital Piano Under $1000: What to Expect? Even with the budget of $1000 there is a huge amount of variation in what you can actually expect from your digital piano. A $1000 piano will likely offer a more realistic feel and sound than a cheap keyboard that costs $200. Fortunately, there are many suitable digital pianos no matter what features you need. Products which cost top dollar tend to be full of features, but these may be more than you need, especially if you are a beginner. Ultimately, this price range is plenty to ensure you have the right model of piano whether you need a lightweight and portable digital piano under $1000 or are planning to purchase something to be more of a permanent fixture in the home. What features should you expect at this price range? What are the most important things to think about when buying your digital piano? A little time considering the features will give you a far better chance of choosing a suitable option as opposed to if you just jump in and buy the first piano you see which fits the budget. This is probably the first thing you should consider before making any sort of choice. Do you need to take your piano out to concerts with you, or to band practices? Alternatively, maybe you are satisfied with the piano being in a stationary spot in your home or studio in which case a heavier product could be suitable. These will be the actual sounds that can be played on your digital piano. Different brands have sampled different sources and acoustic pianos to make the sounds, and some may have organs, strings and more sound fonts to work with. The speakers on the digital piano. You will need to make sure you have enough audio power to clearly hear your playing as well as a good level of clarity. If you are to perform using your piano in the future then you will plug it into a sound system which will take over. Your sound system is purely for home practice. Most top digital pianos will allow you to connect via USB to a computer, and in doing so control virtual instruments or other soundfonts via your DAW of choice. Hammer action on a piano is designed to mimic acoustic pianos, which originally used systems of tiny hammers which gave the keys a resistance. These feel more like playing an acoustic model such as a grand piano. A touch sensitive piano, as well as a hammer action piano, will trigger different samples depending on how hard they are hit, giving more dynamics to your playing. Pedals can add different characteristics to your playing. For absolute beginners, they’re not the main concern, but it is good to at least have an option to plug in pedals if needed. Some pianos will have inbuilt effects. This means you can add reverb to make the sound feel like it is being played within a certain acoustic space, or chorus to thicken out the sound. The more effects you have, the more options and control over the sound are at your command. This refers to how many notes you can play at the same time, or in a short space of time. If you’re only playing chords and aren’t playing anything overly complex then polyphony won’t be the top priority, but if you want to play complex melodies, a high polyphony reduces the chances of notes dropping out and not being triggered. Reading through the above features should have given you a clear idea of which features you should be prioritizing. The Alesis Recital is not an elite product of digital piano and although it has its limitations, it has made it into our list based on the incredible value for money. This is the cheapest product on our list and it has a decent set of features for beginners. Don’t expect to see many professional musicians using these on stage, but for people getting started, it is a good way to test whether piano is the instrument for you. One of the key benefits is that this piano is very lightweight and portable, so you can take it to band practices or similar if you need to. The Alesis Recital has 88 keys and touch sensitivity which can even be adjusted to your own playing style. There are only five different sample sounds, but they’re pretty good quality and more than enough to get started. There is also the option to layer these sounds so more than one play at once. It connects via USB to MIDI which means that you can record your playing or connect to other software. Though pedals are not included, there is an option to add these if you wish. 20W speakers give plenty of power and there are even some inbuilt effects. It is entry level, and makes no secret of it, but this is perfect for certain users. 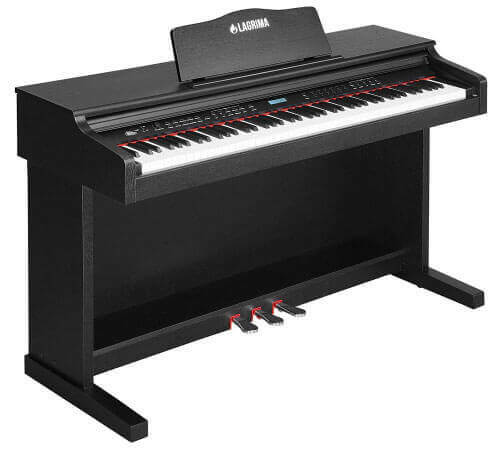 Yamaha’s P-125 is the successor to the P-115 which was a very popular mid-range model of digital piano. The P-125 is an upgrade, meaning more features and even better, richer sounds. This is arguably the best portable digital piano under $1000. The hammer system gives a realistic feel to the keyboard and you also get the amazing bonus of having an improved speaker system which points both upwards and downwards and gives a thicker, stereo sound. There are plenty of sounds to choose from, but the main Grand Piano sampling is taken from the Yamaha CFIIIS concert grand. The CF engine is Yamaha’s method of sampling. It gives a detailed frequency response which is true to the acoustic model. Close your eyes and you can feel like you’re playing a classical grand piano. You can split the keyboard and play different sounds with each hand. There is also the option to plug into computers via USB for recording and playing MIDI devices and virtual instruments. A unique feature for Yamaha pianos, which this is compatible with, is the Yamaha Digital Piano Controller app which can help you to learn how to play and even show you chords and melodies from your favorite songs to allow you to get playing in virtually no time. Though the P-125 is available with a stand which can make it more of a permanent home fixture rather than a portable model. It is unusual to recommend two consecutive models in the same range, and though this has been followed up by the P-125 you can save money by purchasing the slightly older P-115. It has the majority of the features, and just like its successor it can be bought bundled as either a portable model without a stand or with a stand for within the home. The sound has definitely been upgraded on the P-125, but this still offers the excellent weighted keys with a realistic feel. It suits beginners and intermediate players, and due to the fact it is modeled on a Yamaha Grand piano it is popular among people moving from acoustic models. This piano offers 192-note polyphony which means even complex melodies don’t cause dropped notes. If you don’t want the app functionality of the P-125 and aren’t too bothered about the upgraded sound then the P-115 is worth your consideration. Casio is another brand you may associate with music technology. More specifically, they are the manufacturers of many of the most popular keyboards ever made, and they don’t just make the best digital keyboards under $1000, they manufacture exceptional electric pianos such as the Privia PX-160, too. This piano has everything you need as a beginner and is great for people who have a higher skill level, too. The sampled sounds come from Casio’s technology, the AiR or Acoustic and Intelligent Resonator tech which is designed to create realistic sounds sampled from grand pianos. The realistic piano feeling is also aided by a hammer action and even textured keys which emulate ebony and ivory pianos of old. It only weighs 26 lbs, which is very lightweight for a piano and means you can take it to concerts or anywhere else you wish to play. Bundle it with a furniture stand for more of an upright piano’ vibe. The stereo speaker is of decent quality, but could be a little more powerful in an ideal world. The Privia PX-160 reviews tend to be very complimentary as beginners and intermediate players alike tend to enjoy the ease-of-use and portability of this Casio piano. A lot of the products on our list are manufactured by Yamaha. 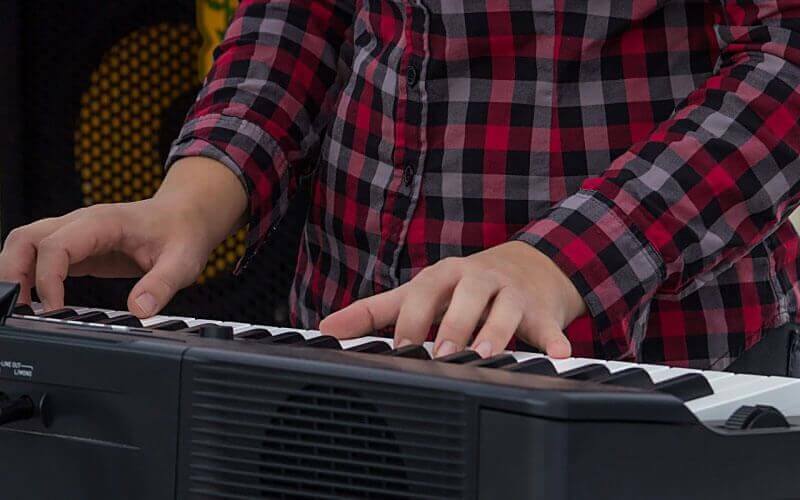 In terms of the value market for digital pianos, they have a number of good quality models, including the P71, an Amazon Exclusive version of their P-45 digital piano. The two are, more or less, the same thing. The P71 has a little bit more of a keyboard “feel”. It has a more complicated interface than some of the other options, over 10 different sounds and the ability to layer them up. Combine different sounds, link straight up to your laptop with USB to MIDI and take this on the road with you with ease due to the lightweight and slim design. It has weighted keys, but not quite the realistic feel of some of its competing models, as the keys feel a little less sturdy than some of the other options. For the price, it is hard to argue with the value-for-money on offer with the P71 (or P-45) piano. It’s easily one of the best digital pianos that you can get for around $500. Lagrima is a name which some people might be surprised to see on the list. It certainly doesn’t conjure the same musical images of Yamaha or Casio, but Lagrima have created a budget digital piano, the LG-8830, which has a lot of features which are appealing to beginners. This is designed to be kept in one place, and is more of a permanent fixture than many of the portable pianos on the list. It weighs over 100 lbs, meaning that it isn’t too taxing to get set up, but you probably don’t want to have to take it to every gig with you. That said, it is a great home digital piano. Though it wouldn’t be accurate to claim this is the best sounding digital piano on the market, and the sampled acoustic piano sounds don’t quite match up to the Yamaha pianos on our list, it is hard to find the same amount of features at this price tag. The Lagrima has a teaching mode, the ability to record and track your playing, effects including reverb and chorus and even all three piano pedals inbuilt. Other features you would expect including MIDI and USB compatibility, inbuilt speakers and dual headphone jacks are also in place. An incredible 960 tones mean a huge range of instrument sounds all at your fingertips at a very reasonable price. Korg is a brand that a lot of musicians will know from the world of synthesizers and recording technology, but they manufacture some brilliant digital pianos too. The B1 is an example of this, a great way to get a quality piano with an 88-key weighted keyboard under $1000. Korg is a brand built on exceptional sounding instruments. Their eight onboard sounds are digitally sampled with a huge amount of accuracy. This is combined with “MFB Servo technology” to give a very rich sound which can be further enhanced with Korg effects. This piano offers Reverb and Chorus. The hammer action Korg has created feels excellent and is very true to the feeling of acoustic pianos. You can feel the class of this manufacturer when you play their instruments. This piano looks great, too. It is simple and doesn’t have any ugly control panels. The B1 design is sleek and comes in either black or white to suit whatever decor is in your home. Purchased with the built-in stand and bundled with a piano bench, it also has a music rest for your sheet music (or tablet) to sit on while you play. Kawai manufactures the best digital stage pianos in many musicians’ opinions. They are very lightweight and easy to take to concerts or practices with you and don’t sacrifice the sound to be so easily portable. Most Kawai models have a common theme – they are expensive. The ES110 is not as pricey as the rest of their range making it the best digital stage piano under $1000. So what is so good about the ES110? The tone comes from a clever sampling technology which uses only high-quality original samples from grand pianos, and then combine this with “harmonic imaging” and other resonance-based effects. The end result is a piano sound almost indistinguishable from an acoustic piano, with none of the transportation challenges. There are 19 sounds in total, and 8 of these are based on acoustic pianos. The 88 weighted keys give the excellent acoustic feel, meaning even if you play an acoustic piano at home and just want the ES110 to take on the road with you, you can simply transition between the two. This piano also comes with an X-shaped stand, perfect for taking on stage with you. It is bundled with headphones and a cloth with some retailers. Yes, it’s another Yamaha! Their range of electronic pianos under $1000 is vast, and the DGX-660 is popular in spite of being one of the few which isn’t easily portable. This isn’t necessarily a negative, though. The DGX-660 is a great quality product which may weigh close to 100 lbs, but this is great for a home digital piano or for one to keep in your recording studio. It comes with furniture bench and is a very classy looking piano, and the main piano sounds make use of the Yamaha CF engine and damper resonance for a realistic replication of a grand piano sound. It is the technical specs and digital capabilities which really make this piano stand out from the crowd. There are hundreds of sounds to choose from, whether you want strings or a harpsichord tone. In this respect, the Yamaha DGX range is similar to some of the best keyboards on the market due to the huge range and variety of tones. 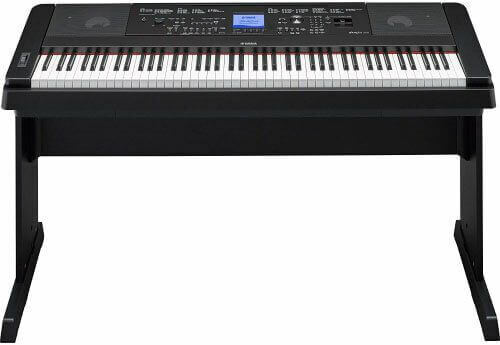 However, the added bonus of weighted keys and rich piano tones make this one of the top rated digital pianos under 1000 dollars. You can choose the acoustic setting to create rich sounds with a variety of different characteristics depending on how you want to sound and the particular song you are playing. An LCD display can show chords, sheet music and even lyrics to help while you play. Plug in a microphone and you can also sing along through the inbuilt sound system. For such an affordable digital piano, it is very hard to find one with more functionality. The DGX-660 doesn’t have the same simple portable design some of the other products on this list boast, but if you want a high technology home piano with loads of sounds and functionality, this is worth considering. The Arturia KeyLab 88 is technically a MIDI controller rather than a digital piano, but it can do exactly the same job if you combine it with your laptop. This makes it a wonderful choice for pianists who are already using their computer to record and edit their sounds. Truly one of the best keyboards under $1000. Though the MIDI controller aspect means that this does not generate sounds on its own, it comes with the UVI Acoustic Grand Piano instrument which has sampled a Steinway grand piano, and you can trigger this using your computer. If you have a decent laptop for music then this will be easy to set up and use, and reliable enough for live performances. Encoders, faders and even assignable buttons allow you to set up a variety of different sounds to trigger from other instruments and DAWs. This means you can have backing tracks fading in and out, percussion sounds and loops you can trigger, all from this one simple workstation. Arturia has a range of synthesizers and virtual instruments, too. These can all be controlled easily and intuitively from the KeyLab. This works perfectly whether you are trying to play classical music with a realistic, sampled acoustic piano, or if you want to trigger beats and play synth sounds. Though not a digital piano exactly, it can do a very similar job if set up correctly with some extra functionality added into the mix. The number of digital piano models on the market has grown a lot in recent years. Many are embracing new technology and making it easier to learn piano, as well as simpler to connect your piano to your computer or other devices to maximize the functions. On this list, we’ve provided both basic and advanced models under 1000 dollars, with options suitable for every type of pianist, from beginner on a budget to professional musicians in touring bands. Spending a little time researching will ensure you choose the best piano for you.